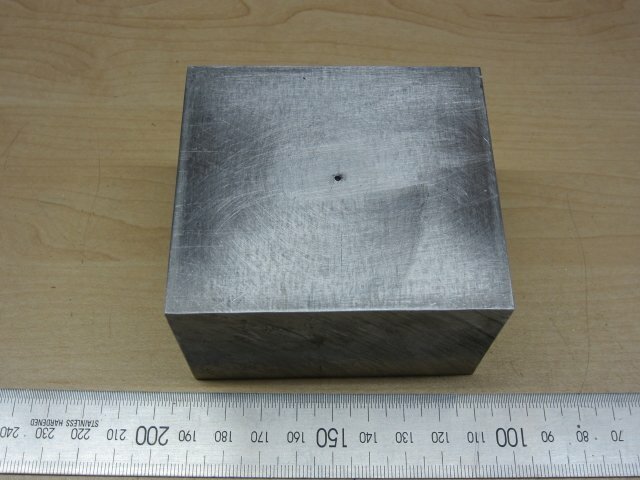 The block in question 3.2” x 2.8” x 2” thick. I have already marked and centre punched where I want to bore/drill a hole or cut a boss. 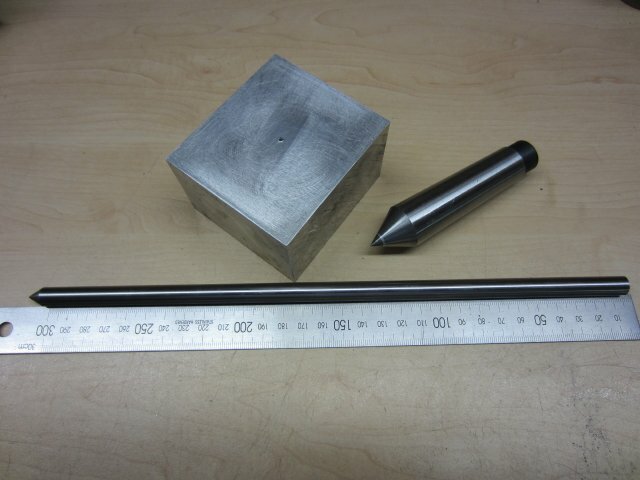 A word about the centre punch mark. The punch I use is only used for this purpose I do not use it for general centre punching. The reason being it was ground carefully to an included angle of 60 deg. Also the mark is produced by taping a number of times and rotating the punch, all the time keeping it perpendicular to the face. If one is trying to centre the block + or – ½ a thou or so, then the centre punched mark needs to be done with care. Giving it one almighty whack isn’t really the best start! Here are the bits we are going to use. A MT3 (non rotating) centre, and a “centring” bar. I call it a “centring” bar it’s that long thing at the bottom next to the rule, just to note it is a solid bar it is not sprung loaded. This is the set up. The mag clamp in the foreground is to hold the camera. 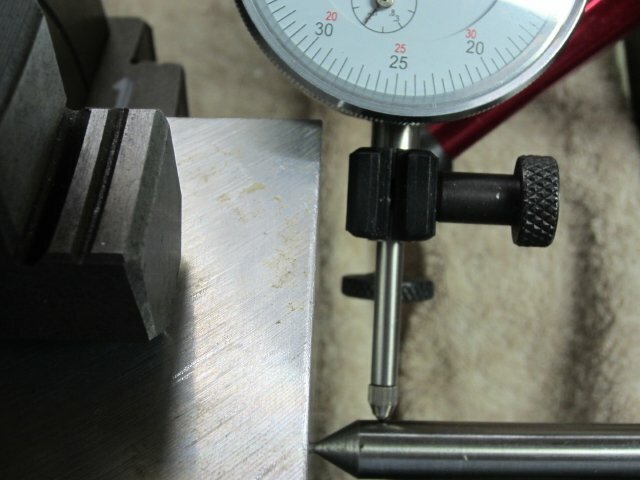 The rectangular block is chucked up – try to get it as close to being central as you can, use the concentric circles on the chuck. Just pinch up in the jaws, the block needs to move. The plunger of the dial gauge needs to be as close to the pointed end as possible, this is where the maximum movement is. 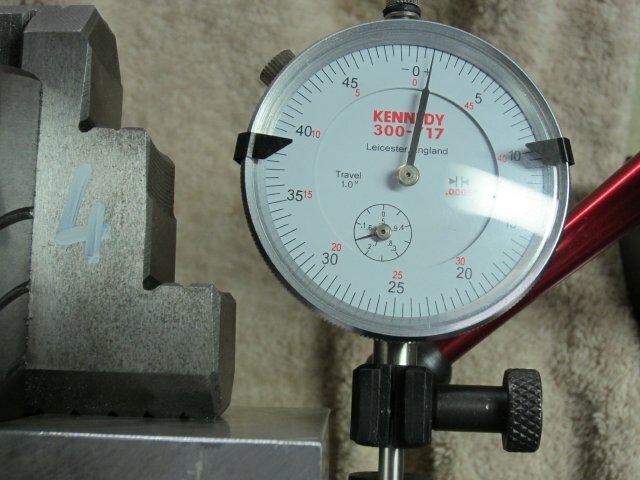 I had to change the dial gauge to a 1” travel one to accommodate this, otherwise the block would hit the dial gauge. Starting with jaw # 2 zero the dial gauge using the cross slide. 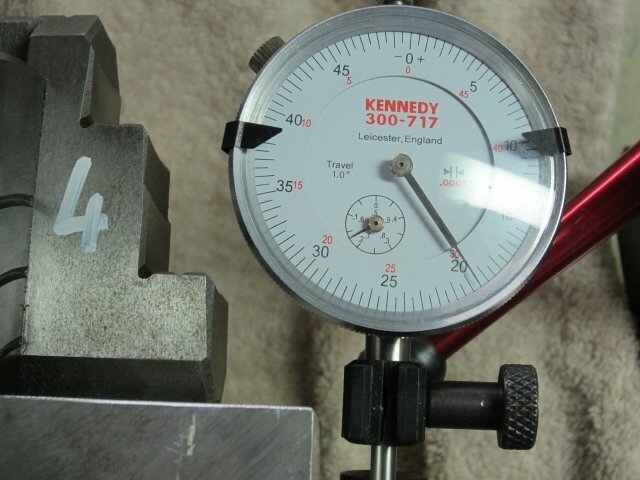 See what dial reading we get for jaw # 4. The needle has moved 40 divisions. So by adjustment of jaws # 2 and 4 the block is moved (back) to give a reading of 20 divisions, half of the 40 divisions moved. 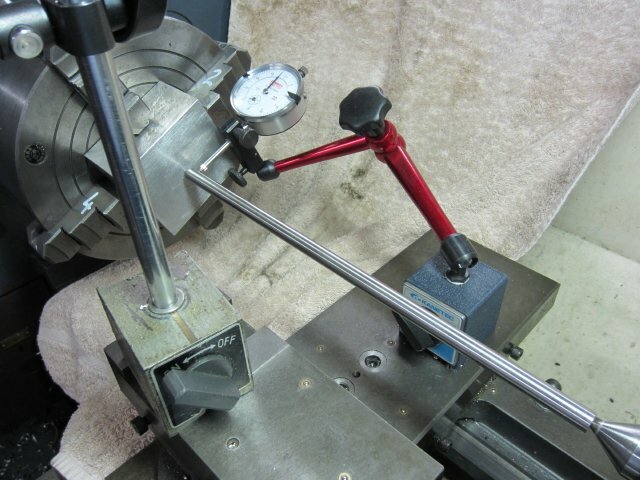 Turn the chuck back to jaw # 2 and zero the dial gauge by moving the cross slide. Do the same for jaw # 1 and 3. During the final tightening do opposite jaws and watch the needle movement on the dial gauge. Here one needs to be careful, gentle, and watchful. Now one does not always need it to be so accurate and if it is out by a thou or two – that may be fine. You can if you look carefully see the needle does move a touch. 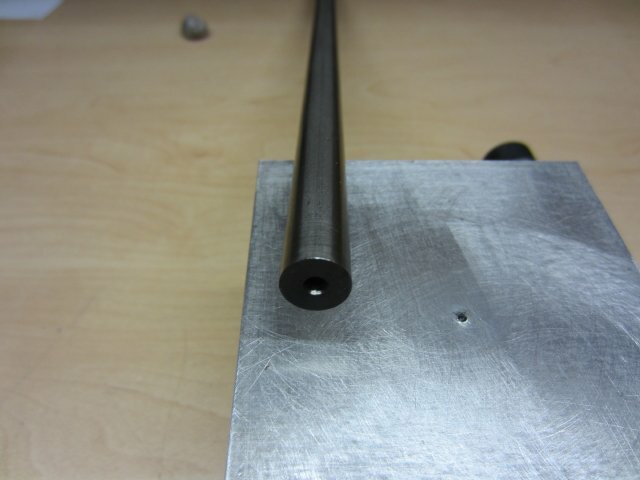 Now you can turn that 2” dia boss or bore a 2” hole. Some important points to note. The “centring” bar is the prime bit in all this. It must be straight, and it is easy to check to see how straight it is. When it is all set up zero the dial gauge turn the “centring” bar see how much the needle moves – it should hardly move at all. 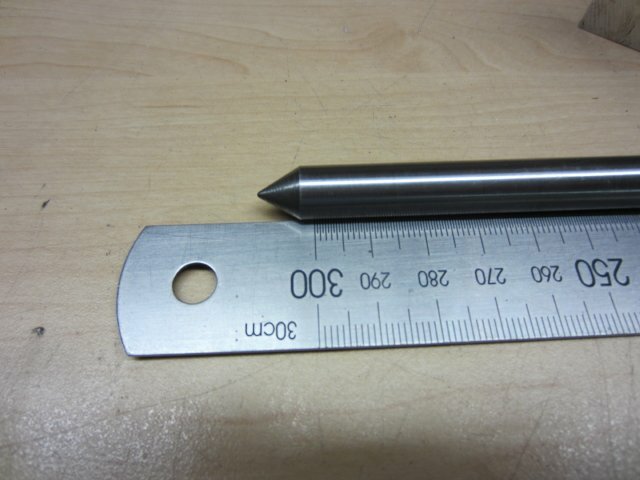 This “centring” bar should be a snug fit in the non rotating centre and the centre punch mark, that is to say it will turn but there is no lateral movement. This snug fit needs to be checked often and after each adjustment of the work piece (very important). This is why spring loaded “centring” bars are used. 1) If you do want to use a spring loaded one it must have no (none) lateral movement. 2) I’m too damn lazy to make one. Then there is the proverbial question should the “centring” bar be allowed to turn or should it not be allowed to turn. Well if your “centring” bar isn’t dead straight, then don’t allow it to turn. If the “centring” bar is dead straight, then you choose. Nicely done David. And your photographs are outstanding! Might I also congratulate Dave for his contribution? Mine is a fairly simple sort of one but I 'spring loaded' mine with an internal spring to save ( I think) getting annoyed having to adjust the tailstock poppet during set up. It isn't new, mine came from Model Engineers Workshop Manual by George Thomas. Regarding set the 'spot', I tend to use the one of these lens affairs which have a series of cross hairs and spots, and belt the point with a toffee hammer. Mine was a commercial affair but the design or concept has been published and re-published over the years in Model Engineer etc. I recall 'Geometer' doing a series called Microscope on the Lathe. 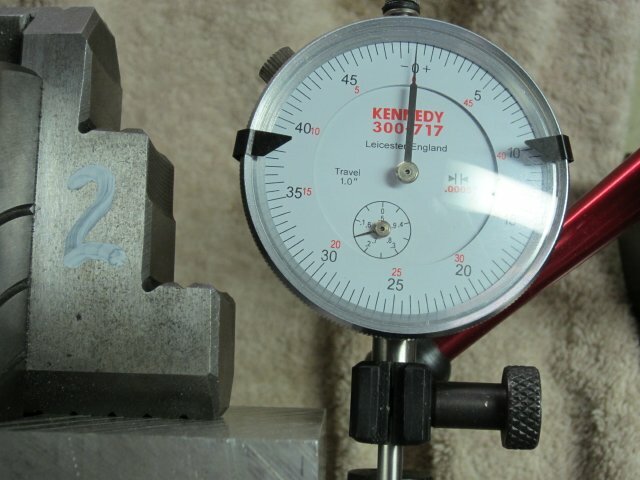 It still is on the Nemes-s.org site and I wrote about it way back in Homeshop Machinist. It's all perfectly simply and cheap now because 'foreign' but quite decent binoculars and children's microscopes are available to add to the workshop tools. I tend to use a a folding eyeglass which was given to me years ago by the author of 'Stephenson's Gear' and 'Walshaerts Gear'. I think Don Ashton has amalagamated his two books now. My other 'tool' is a pair of surgeons operating glasses which I mentioned just recently. A good spring loaded centring bar does help - no doubt about it. Keeps it nice and "firm"
Nice to have 'quality suggestions' so well illustrated. Somewhere, I have a 'tenths' dial mike but I need a Sherlock Holmes magnifying glass to find it. Dave, more of the same, please! Thank you for the nice pics' and wrigthup.